So, we're still only halfway into 2013 and we've hit a bit of a problem with the pre-console war build up for the 2013 holiday fallout: The PlayStation 4 has kind of buried the Xbox One and Wii U on one of the world's biggest online retailers, the world around. In Germany, France, America, United Kingdom and Canada, the PlayStation 4 has ranked as the best selling home entertainment console on Amazon, above and beyond the competition. This kind of fits the narrative that Amazon revealed recently, in which the next-gen consoles from Microsoft and Sony were selling at a peak rate of 2,500 units per minute. 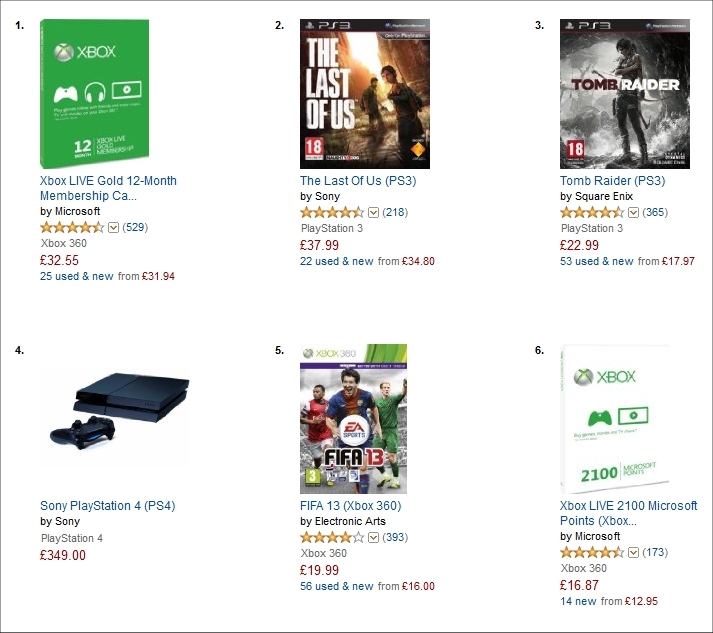 As of the writing of this article, the PlayStation 4 is currently sold out in America on Amazon, but is still a best selling item over the Xbox One which sits at the number 6 spot on the list. The PS4 ranks third behind the Sony PlayStation Network $20 card and the Xbox Live 12 month subscription card. I guess not all Americans choose football, sports TV and watching TV on their TV over traditional gaming. You can check out an image of where the PS4 ranks below. Moving on... we end up at Amazon UK. In this situation we're looking at the best selling items and the PlayStation 4 is the fourth best-selling item in the entire video game category, and once again, the best selling home gaming console so far. The ironic part about it is that the item that seems to be out-selling everything consistently are Xbox Live Gold membership cards. Maybe Microsoft shouldn't have been so quick to switch from MSP to real-life currency once the XB1 launches, eh? I'm sure they'll have replacements for the MSP cards once the Xbox One gets situated sometime next year. You can check out Amazon UK's image below. 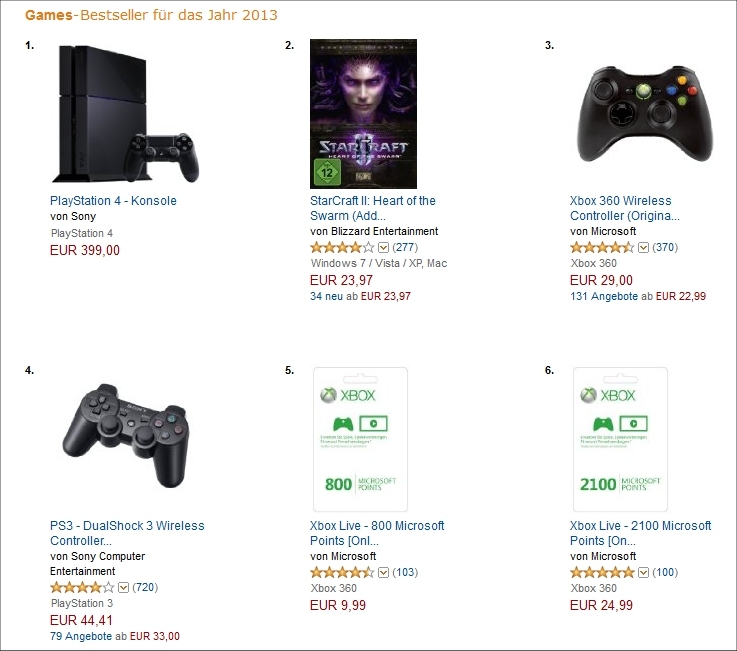 Next up is Germany's Amazon page, where we can see that the bestsellers in the video game department has the PlayStation 4 at the number one spot. Wow. I think a lot of this has to do with the spread of privacy concerns regarding the Xbox One's Kinect, which is why the console is further down the list at the 17th spot. 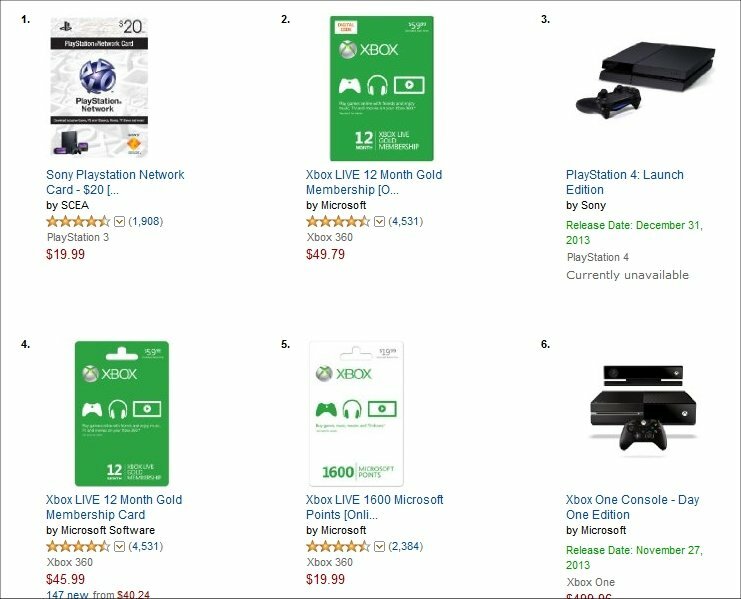 Like clockwork, though, the Xbox Live Gold membership cards at the 800 and 2100 MSP price points are still near the top of the list, showing that even though a lot of people don't seem to be buying hardware all that much this year (with the exception of pre-orders for the new consoles) the Live Point cards are still indubitably hot sellers no matter where gamers are in the world. In France, things look a little different. The French seem to appreciate racing games and more philosophical titles... well, not really, but a lot of the usual suspects are still topping the list save for the fact that there is a lot more love for Nintendo software titles on France's Amazon bestsellers' list. Still, as far as game consoles go, the PlayStation 4 has the Wii U and Xbox One beat out by a fair margin, in fact the Xbox One is way back at the 43rd spot. Ouch. If the French's bestsellers buying habits are anything to go by, they seem to like a lot of Nintendo software but prefer Sony's PS4 hardware. Perhaps they're just pre-ordering on the philosophical principle of consumer rights activism but they're really, deep down, Big 'N' fanboys who enjoy pro-cycling video games. Ahaha, Canada.... ahahaha. 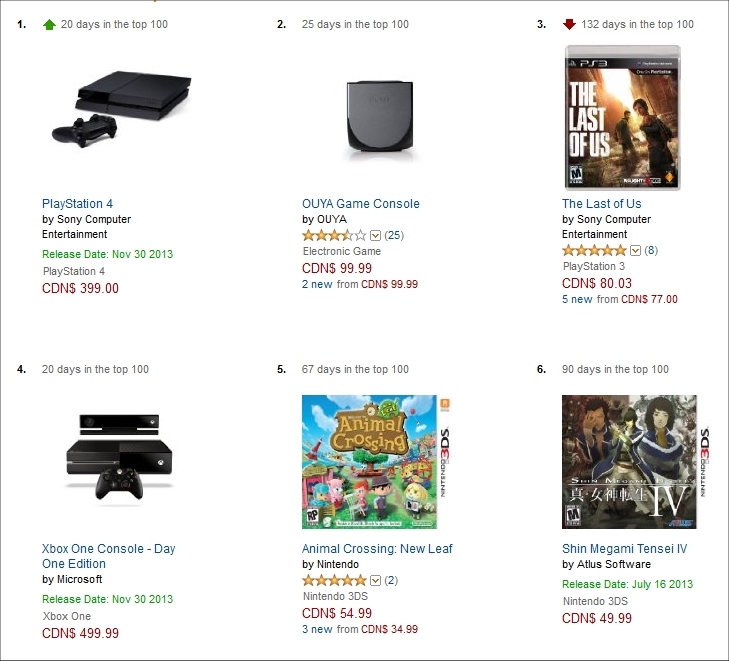 Canada's Amazon bestsellers list is hilarious. 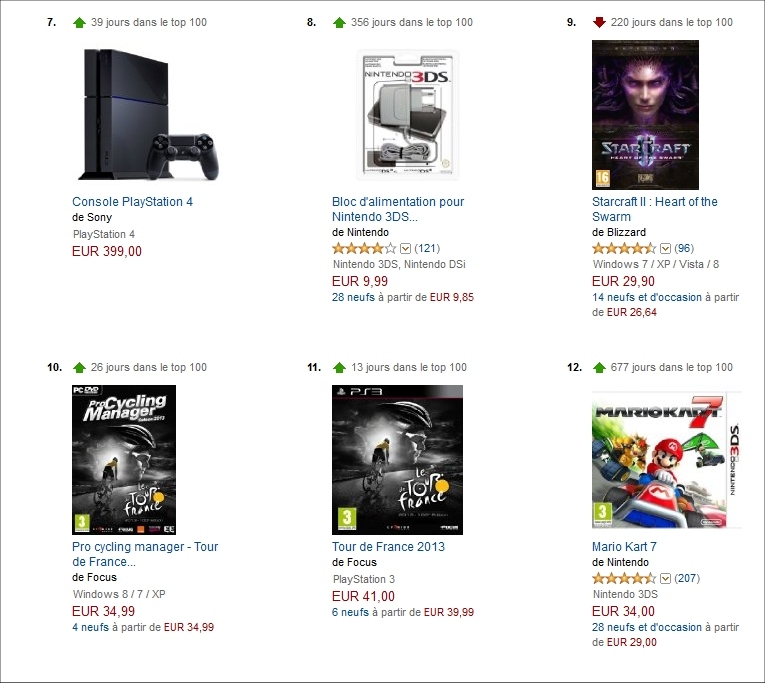 If you thought French buying habits were funny, you should just see what the second best-selling item is on their list. You'll never guess... okay, I'll give you a hint it rhymes with “Booya!”. That's right, in first place is the PlayStation 4 but in second place is the recently launched and frequently sold-out OUYA. The OUYA folks, is out-selling the Xbox One in Canada. Ahahaha. Oh my gosh, that's unbelievable. I can't believe that. The Xbox is in fourth place behind The Last of Us but it at least beats out Animal Crossing: New Leaf and Shin Megami Tensei IV, more Nintendo games that sell well enough to allow Reggie and Iwata to import hash from Jamaica and smoke it in golden bongs shaped like Link's Master Sword. Big ballers balling big at the Big 'N', yo. Nevertheless, it looks like there's hope for Canada yet: Canada, you've redeemed yourselves from the atrocity that was the world pre-order list from mid-June. Congratulations on showing that you have pro-consumer balls... albeit they appear to be made of jelly beans. #GoCanadaGo!